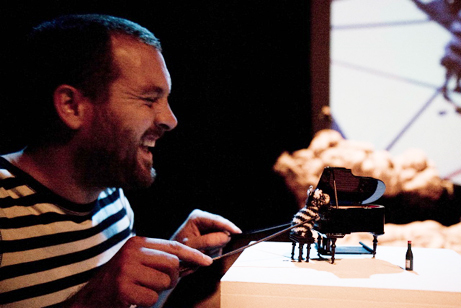 Ulysses Black Plays Minature Jazz Piano Zebra (with live-feed projection behind) in Annie Brooks' Colossal Crumbs. 2009. In 2009, performer and artist Annie Brooks launched into puppetry with her debut show 'Colossal Crumbs' with puppetry from Ulysses Black, Sarah X Delmonte, Howard Sivills, Han Nicholls, Merry Colchester and Sophie Ingliss. Through the puppets and organic set the show developed a warm yet dilapidated aesthetic in a show that saw use of both miniature puppets and one in excess of 8ft. As the intestinal landscape became a giant puppet, the puppeteers became wranglers. Puppet tomatoes fed cloth spaghetti to other puppets during a can-can extravaganza, while cloth faeces transformed into tiny ploughed fields. In the closing segment, a hand sized puppet crosses the stage and emerging into a pool of light, alights upon the roof of a gingerbread house. Having turned to look up wistfully at the face of the puppeteer (Annie Brooks) looking back to him, the small puppet is then suddenly thrust through the roof of the confectionery cottage, before the puppeteer proceeds to devour the bread building in giant mouthfuls, spewing crumbs, colossal crumbs. In the next second, the small tree now recognisable as a head of broccoli. A few more chews before Annie Brooks notices the puppet attached to her hand. For a split second she looks at it, and the thought flashes almost imperceptibly across her face. In the next instant she sinks her teeth into its head and tearing it from the puppets body, riddled with foam wadding and tights-nylon she masticates and swallows. Lessons learned. It is quite a challenge staging multiple performances and destroying a whole purpose made, sufficiently large, gingerbread house at the end of of every show. Particularly when you are at a festival for 5 days. It was a secret that we kept gingerbread houses, carefully wrapped hidden under a Landrover to avoid the fluctuations between searing sunlight and torrential downpours. Ulysses Black was puppetry director and puppeteer on this production.